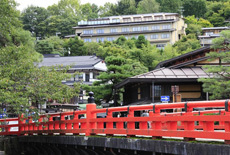 A great location from which you can reach sightseeing spots such as Takayama Jinya (Historical Government House), the morning market and the old town by foot in 3 minutes. Efficient service. 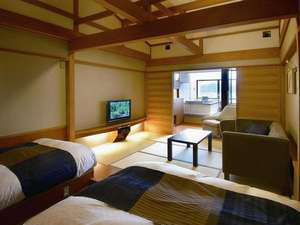 A comfortable and calming ryokan. We serve dinner in the dining room.Guest rooms with rotemburo on the top floor and the women-only relaxation room were renovated to create a relaxation space in April, 2010. 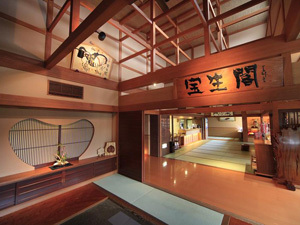 Prices exclude tax and the onsen facilities have a separate bathing tax. One can feel the skills of Hida-no-Takumi carpentry in the lobby. A relaxing Japanese space spreads out from the tatami corridor. 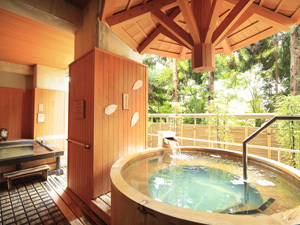 Gaze at the view of the mountains and the town of Hida while spending a relaxing moment in the women-only Orihime bath. A room with a rotemburo only for you. A combination of a comfortable Western space and a relaxing Japanese space. 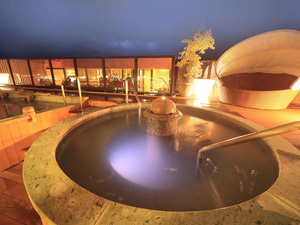 The large public bath also features a rotemburo with Hida Takayama onsen. Enjoy the feel of the seasonal breeze on your skin as you soak in the bath. Neuralgia, muscular pain, the joint pain, and the frozen shoulder, and it sprains it, and it is a chronic digestive organs disease, a piles, a cold constitution, a tiredness recovery, and a promotion of health.